Herbal 'erukku' (giant Milkweed in English) lamp wicks, made from the small fibres of the stem of the plant, have the subtle, powerful and miraculous ability, when burned, to destroy and remove negativity from the environment, body and the mind (Siddha medical tradition). Twisting the cotton wicks with the erukku help the erukku wicks to burn slower therefore last longer. These can be used in any oil burning lamp and is especially recommended for a Saturn sesame oil burning lamp. 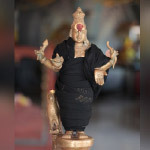 Herbal 'erukku' (giant Milkweed in English) lamp wicks, made from the small fibres of the stem of the plant, have the subtle, powerful and miraculous ability, when burned, to destroy and remove negativity from the environment, body and the mind (Siddha medical tradition). 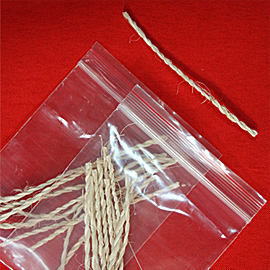 Twisting the cotton wicks with the erukku help the erukku wicks to burn slower therefore last longer. These can be used in any oil burning lamp and is especially recommended for a Saturn sesame oil burning lamp. These malas were energized in a Full Moon Fire Lab to invoke the Archetypal Feminine. The rose quartz is considered the "love stone". It promotes love, compassion and forgiveness and is often associated with Archetypal Being Saraswati (associated with intelligence, higher learning, and artistic/musical talents). It also has a calming influence and helps clear negative, stored emotions such as anger, resentment, jealousy, and fear. You may wear it or use it to count recitations of sounds.